The level of regulation is on the rise, both in Kentucky and in Washington, DC. How to respond to this situation is an important question for policymakers at all levels of government. The US Code of Federal Regulations (CFR) stood at just over 178,000 pages in 2015. That’s up from a little over 71,000 pages in 1975. With only a few exceptions, the CFR has grown year after year as thousands of new rules have been added to the books. But this is far from the end of the story. In addition to federal regulation, state and local governments issue regulations too. This raises the question of whether regulation is on the rise in the states as well, or if the upward trend of regulation is only a federal phenomenon. One state where data on regulatory trends is available is Kentucky. 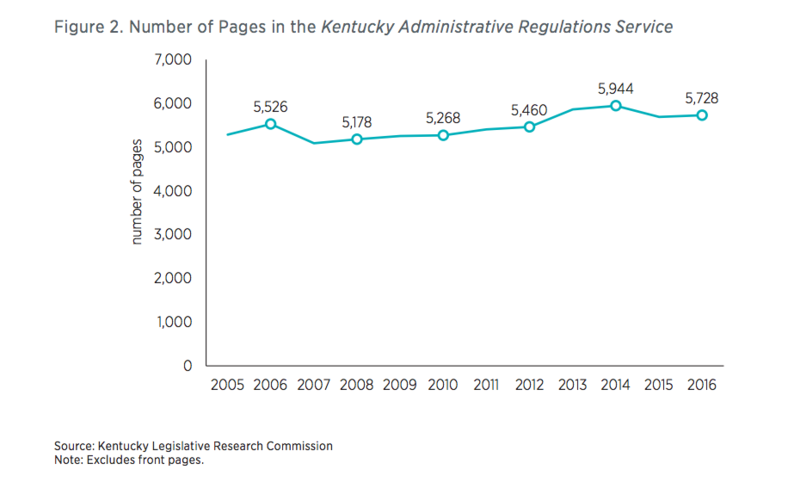 Each year, Kentucky publishes its regulations in a set of volumes known as the Kentucky Administrative Regulations Service (KARS), which is the state’s equivalent of the CFR. As figure 1 shows, in 1975, the KARS was comprised of just four books. By 2016, however, it had grown to 14 books, an increase of 250 percent. The only year in that timeframe when the number of books declined was 2007. Even then, the decline was completely offset two years later. 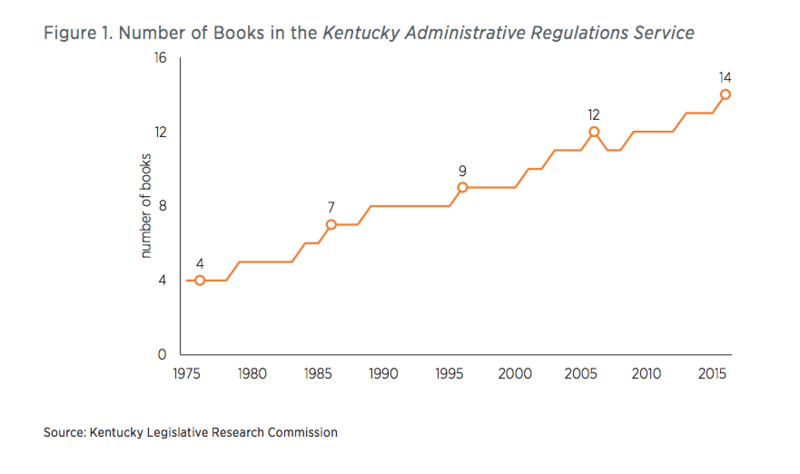 Another way of quantifying the amount of regulation in Kentucky is to count the number of pages in each year’s KARS publication. Unfortunately, data on page counts do not go back as far as data on the number of books. Nonetheless, the data are revealing. Excluding front pages, the KARS was 5,285 pages long in 2005, and increased to 5,728 pages in 2016, as shown in figure 2. That’s an increase of roughly 8 percent over the 11-year period. Just as the number of books declined in 2007, so too did the number of pages in the KARS. However, a separate decline in pages also occurred in 2015. This decline did not show up as a change in the number of books, highlighting how the two metrics can diverge at times. Unfortunately, page counts for the CFR and KARS are not directly comparable because of differences in the books’ formatting. Nonetheless, the trend is clear. Regulation is on the rise in both publications. A growing regulatory code is not a problem, within reason, but policymakers should avoid allowing a body of legal text to grow without limit. A code that is too large is difficult for the public to comprehend. This complexity can result in reduced compliance, reduced incentives to improve safety on the job, and increased uncertainty. Complexity also gives larger, established firms an advantage as they have the resources and compliance personnel capable of navigating a complex legal system. Unexpected interactions between federal and state regulations are also likely to increase as both sets of requirements grow. This means coordination of rulemaking across the various levels of government will be critical. Yet it is unclear how much such coordination actually takes place. If states like Kentucky want to prevent the level of regulation from growing indefinitely, one option would be to place a cap on how large the code can grow. One version of this approach requires regulators to eliminate an old rule for every new one added to the books. The Canadian province of British Columbia instituted a policy along these lines with considerable success. Another option available to states is to organize a committee of experts whose job would be to periodically review the regulatory code, identify problematic rules, and recommend ways to remove or modify those rules deemed unnecessary, ineffective, or inefficient.